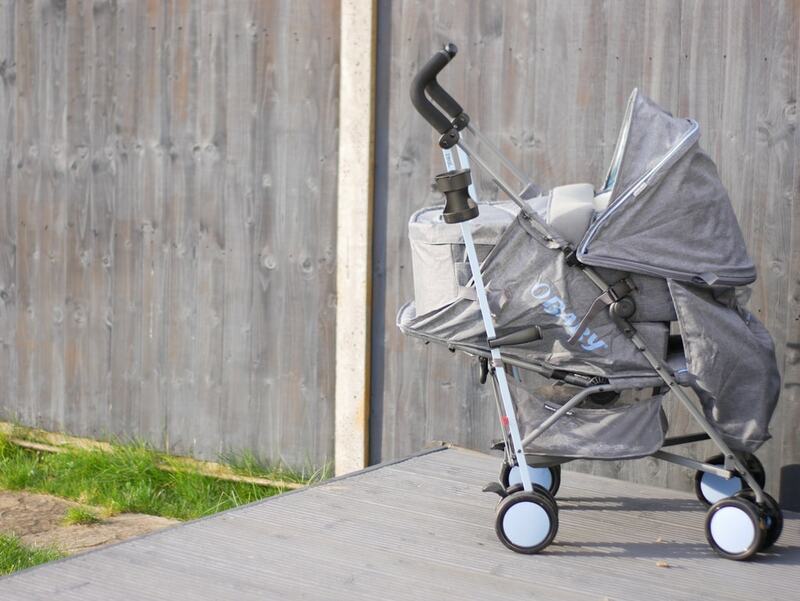 We have been road testing the Obaby Zeal Little Prince Stroller and carrycot for the last six weeks. We wanted a travel system for ease of use and flexibility so we purchased the compatible Obaby Car Seat (including adapters) separately – I will include it in this review. Obaby Zeal Little Prince Stroller – What’s in the box? What age is the Obaby Little Prince Stroller suitable from? What are the dimensions of the Obaby Zeal Stroller? What colours does the Obaby Zeal Stroller come in? The Obaby Zeal is available in 4 different designs: Cottage Rose, Little Princess, Little Prince and Born to Rule. 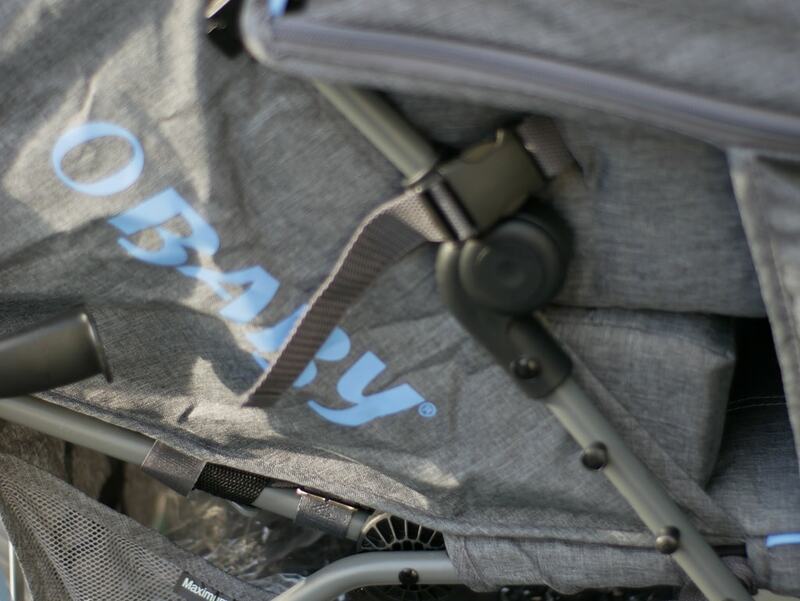 How easy is the Obaby stroller to set up? The stroller arrived in a large box and was nearly fully assembled – I just needed to attach the wheels and then unfold the stroller to be able to use it. 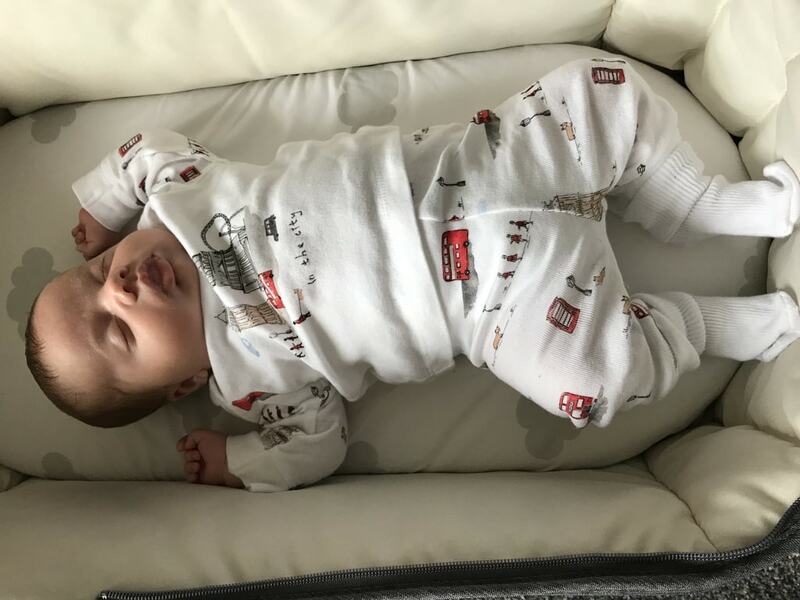 The carrycot arrived in a separate box and was a little more time consuming to set up – although the process itself was very straightforward – I just needed to push plastic inserts through various holes and lock them into place. The Instructions we incredibly easy to follow though; we had a Hauck travel system with Lily and it was so difficult to put together that the only person who managed to do it was my mums neighbour (who by trade was an engineer!). The car seat arrived fully assembled. The first time we used the travel system we used the carrycot. It was quite tricky to attach to the stroller but I think that’s because a) we were will still getting used to what we were doing and b) everything was just a little bit stiff. Now we’ve been using the Obaby Zeal for a while both Mike and I find it a lot easier to use. The carrycot attaches to the stroller using a wedge behind the head, two poppers at the front and two clips at the rear. I do still sometimes find it a little tricky to line everything up! The stroller is quite heavy to lift – Mr H has no issue with it, but for me after my c section, I still struggle to lift the stroller at 6 weeks. The stroller is easy to fold, once you know how! The car seat is easy to attach using the adapters provided. Again, they were stiff at first but now it comes second nature to me and I find them easy. Once the adapters are on the pram the car seat drops into place. I do still find it tricky sometimes to get the car seat to lock into place and it takes a couple of attempts. The stroller is very lightweight to push even with the carrycot or car seat attached. I had a planned c section and for me this was a huge advantage of the Obaby Zeal. The lightweight feel may come at a slight cost though as the suspension seems a little flimsy – on perfect tarmac pavements you wouldn’t notice but on the bumpy lane we use to get to school in the morning I can see the baby rocking about quite a bit from side to side. When detached from the stroller we use the carrycot as somewhere for the baby to sleep downstairs. We bought a firm flat Moses basket mattress and a couple of fitted sheets. The carrycot has saved us buying a separate Moses basket for George to sleep in. George really likes sleeping in the carrycot. The stroller has a 4 position seat unit with one that reclines fully making it suitable to use from birth. The stroller has a UV 50 protection hood with a parent window – I really love this feature as Lily’s pram never had one and I had to stop and walk to the side of the pram whenever I wanted to check on her! The stroller hood also has a very handy discreet zip pocket which I use for my keys/purse/phone & asthma pump for the walk to school – it saves me carrying around a handbag! The stroller comes with a handy cup holder too which is brilliant for me as I carry a bottle of water everywhere! The car seat is installed into the car easily using the seatbelt. Unfortunately the car seat does not have an ISOFIX base so it needs to be strapped in each time. As with everything this has got easier with practise and as things have loosened. The stroller has a moderately sized shopping basket underneath but this is completely unusable when the carrycot or car seat are attached as there is very little access to it. I now only use it to store the rain cover and an emergency nappy/pack of wipes. The stroller comes with a rain cover included. The rain cover is very easy to attach, however I would have liked the reassurance of seeing some mesh or tiny air holes at the side. The stroller also comes with a changing bag. The changing bag, while small & lacking in any compartments to store things such as milk separately does have a changing mat included and would be useful for short/quick trips. The stroller comes with a footmuff and it’s nice to see this includes as a lot of strollers tend to have this as an added extra. Overall I think this is great value for money. Although things were a little stiff at first and tricky we soon got used to everything. In my experience the teething problems we had with things being a little stiff and tricky to work out at first happen with most strollers/travel systems. I should know as Lily had three different ones all at varying price points. The lightweight feel when pushing for me is a must and it’s for that reason that I would recommend the Obaby Zeal. The Zeal has lots of handy free extras such as the cup holder & footmuff. It also has a great zip pocket in the stroller hood. I love the parent window too. I also love that with the carrycot attached the baby is parent facing; this option is left out on a lot of strollers and I think when babies are small it’s important for them to have the security of being able to see the parent and vice versa. 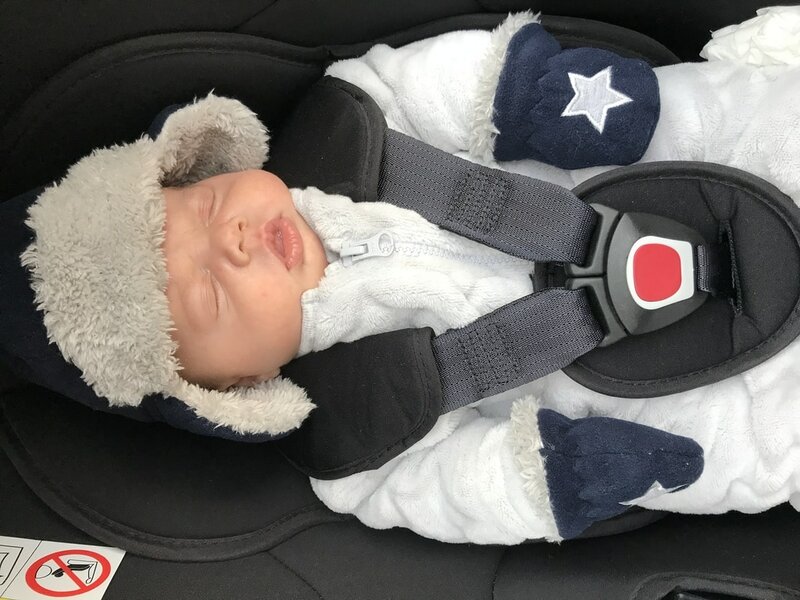 Most importantly of all, George is really happy using the travel system – Lily used to scream on car journeys and it’s a pleasant surprise that George is happy and comfortable when travelling and when out and about. The stroller comes with a 5 year guarantee for extra piece of mind – you just need to register the product within 28 days of purchase. Disclosure: We were sent the Obaby Zeal FREE in exchange for an honest review.